Ani Kavafian is an Armenian violinist and teacher born on May 10, 1948. She first came to the U.S. from Turkey in 1956. She began violin lessons at age 9. Among her teachers were Mischa Mischakoff and Ivan Galamian (Juilliard). Her Carnegie Hall debut took place in 1969. In 1973, she debuted in Paris. 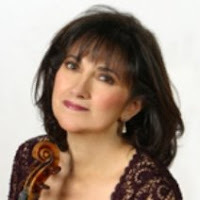 Since 1979, she has been much involved in chamber music performances with the Chamber Music Society of Lincoln Center (New York). She has also served as concertmaster with the Seattle Symphony and is currently the New Haven Symphony’s concertmaster (Connecticut.) Kavafian has taught at the Manhattan School of Music, the Mannes School of Music, and the Sarasota Music Festival but (commercial) solo recordings are very, very few. Her sister Ida Kavafian, with whom she frequently performs, is also a well-known musician.